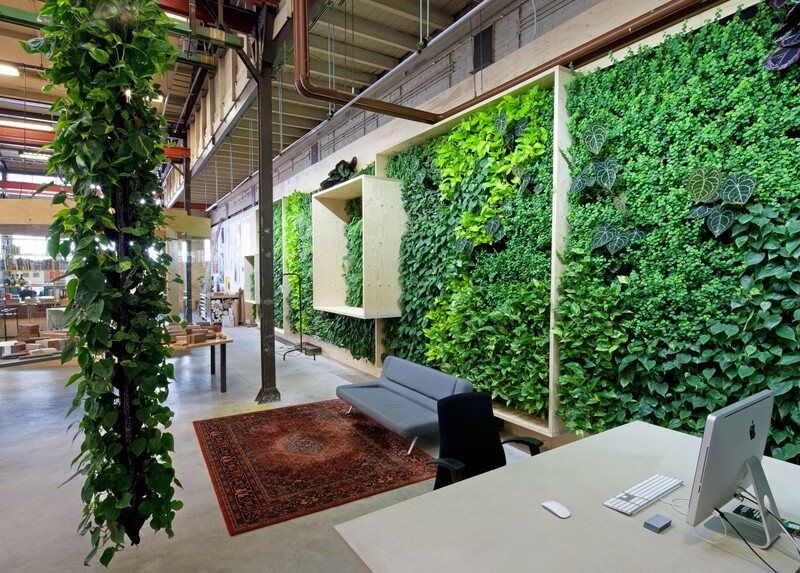 This 45m plant wall is located in the Dutch Green Fortune headquarters in Amsterdam Noord. 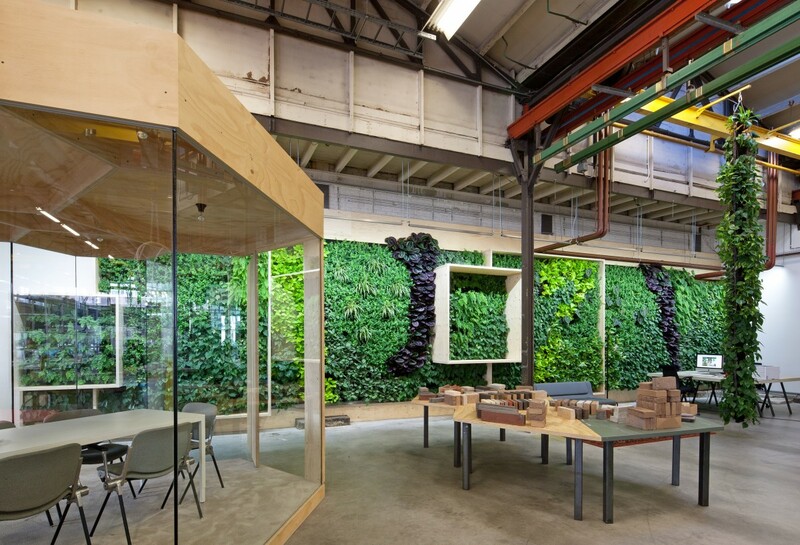 Together with interior architects i29 we tried to take plant walls to the next level by integrating a work-station and including wooden squares to create a visual bridge between the natural look of the plant wall and the industrial feel of this former industrial warehouse (http://www.111.amsterdam/). 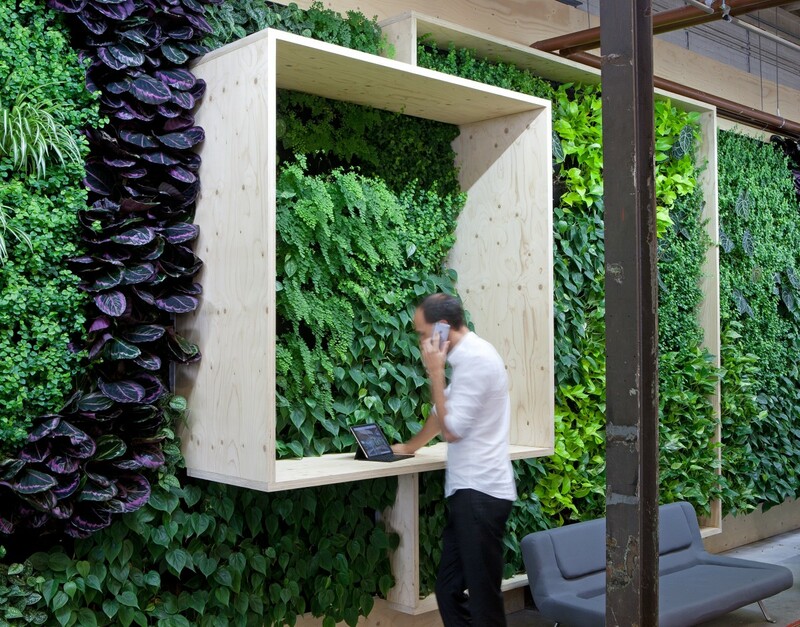 The dedicated workstation can be used for stand-up working, phone calls or two person meetings, leveraging among others the acoustic benefits of plantwalls. In order to integrate the handmade wooden structure, we had to overcome difficulties in maintaining a seamless planting pattern without any gaps which we solved by leveraging the flexibility of our plant textile system and carefully choosing the right plants for the surroundings. Overall, it was also important to us to maintain the character of the building while integrating nature in this industrial setting. Therefore we use industrial looking LED light strips for plant wall lighting. When it comes to the overall planting style we chose to go for a diverse plant composition that combines different colours (green shades, red) and both wilder elements such as ferns with more calm planting structures into an overall harmonious yet interesting plant wall. Next to the plant wall, the space also features a 6m plant wire. While Green Fortune has installed some plant wires in other locations, this is a good example of how plants can create a visual and emotional bridge between different room levels and ceiling heights.